As the start-up ecosystem flourishes in India, here’s an attempt to teach students to zero in on a viable idea, build a saleable product and make a business out of it. Careers360 brings you Startup Village Collective, an organisation that believes in building a world-class learning platform exclusively for student founders. Read on to know more. For tens of thousands of engineering students who graduate out of colleges in India every year, the IT sector is the current default employment option, and an MBA is the higher education pursuit of choice. A relatively small proportion of students aspire to take off on their own, and fewer still are able to convert their start-up dreams into reality, for want of know-how. There are very limited academic options for students who wish to make entrepreneurship a career. The courses on offer have mostly to do with the management or financing aspect of it, which do not really equip them to set up a real company from scratch, that is, teach them how to zero in on a viable idea, build a saleable product and market it to customers to make it a business. Stepping into this learning gap is the Startup Village Collective (SV.CO) — a group of professionals from the field of engineering, technology, design, arts and science, Fortune 500 companies, city/state governments — who have come together with the mission to build a world-class learning platform exclusively for student founders. The SV.CO team is best known for Startup Village, India’s first public-private partnership telecom technology incubator based in Kochi, Kerala’s financial capital. “Those who get an early start are going to make the most of these available opportunities; which is why we are campaigning to get start-ups and entrepreneurship right into school and college campuses. This will not only create a large pool of future job creators, but incrementally improve the overall startup ecosystem in India,” he added. Kris Gopalakrishnan, the co-founder of Infosys, has been one of the earliest supporters of Startup Village. “India needs a new generation of students who are risk takers and willing to chart out their own path. Creating a start-up along with engineering education is a great way to gain industry exposure, knowledge and skills. This will help students to make an informed decision whether they want to pursue the path of being an entrepreneur or use the experience to get good jobs in the industry at the time of graduation,” he said. Arihant Dugar, a fourth year B.Tech Computer Science Engineering student at Manipal University, Jaipur, is one of the SV.CO founders who appreciates the stage-by-stage learning process. As part of their SV.CO project they developed Curis, a healthcare application, which allows customers to set reminders for taking medicine. The team has raised the first round of funding for and is planning to build it up further. 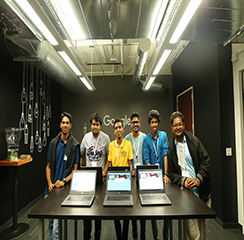 SV.CO follows a very unique process where every student, anywhere in India, is given the support to register his or her campus start-up and guided to build the start-up into a company. As the students progress through the journey, they get access to more resources and mentoring and eventually on reaching maturity, the right introduction to investors and access to Silicon Valley.